When Walt (Jessie Eisenberg) and Frank (Owen Kline)'s parents, Bernard and Joan (Jeff Daniels and Laura Linney) separate, the brothers are forced to deal with the painful consequences of an acrimonious divorce. 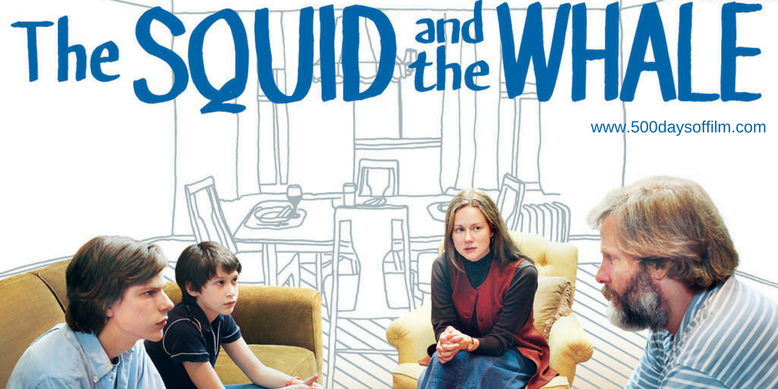 “Mum and me versus you and Dad.” The first words of Noah Baumbach’s film, The Squid And The Whale, may reference a tennis match but they also foreshadow the family allegiances that will soon come in the wake of divorce. Based on the experiences of his own childhood, Baumbach navigates the emotionally devastating impact of the split on the Berkman’s two sons. Walt, in thrall to his father, directs his rage at Joan. Meanwhile, Frank, emotionally distant from Bernard, sides with his mother - processing the familial fracture in different (yet no less disturbing) ways. As a result, The Squid And The Whale is both a tale of divorce and also a coming of age story - as the boys gradually (and painfully) discover their parent’s flaws. If you have seen any of Noah Baumbach’s films (for example, Frances Ha, Mistress America or While We’re Young) you will know that he is a wonderfully insightful writer/director whose incredibly smart scripts are made to savour. The Squid And The Whale is no different. There are endless gems of dialogue here - you almost want to pause the film to appreciate them all. For example, I love how the family discuss literature over dinner (A Tale Of Two Cities is dismissed as minor Dickens). However, such intellectualism a mask - one that hides the deeper problems in the Berkman family. Self-obsessed and arrogant, Bernard (a superb performance from Jeff Daniels) uses such dismissive opinions to bolster his own ego. His literary career is in decline and he feels hugely resentful that Joan (also a writer) is becoming increasingly more successful. Bernard basks in the glow of Walt’s admiration. However, Walt finds himself unable to formulate his own views or see life in any way other than through his father’s pompous, hyper-critical eyes. Meanwhile, Joan (brilliantly played in what is a complex role by Laura Linney) is wracked with guilt about her extramarital affairs, unable to rise above her own failings in order to guide and nurture her own sons. As Baumbach’s film ventures further into this unhappy situation, so its atmosphere becomes increasingly uncomfortable - with scenes that are actually agonising to watch. This sad portrait of parents damaging themselves and their children makes The Squid And The Whale, for all its blackly comedic moments, sobering indeed. Have you seen Noah Baumbach’s The Squid And The Whale?